You’re back in the office bright and early, you’ve had your first few sips of coffee, and now you’re ready to jump back into the Filing you were working on yesterday. 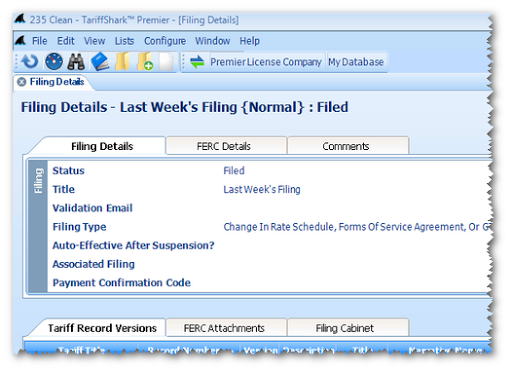 Did you know that you can bring up the Filing Details quickly in TariffShark? On TariffShark’s “View” menu there’s an item labeled “Recent Filings”. As shown below, it provides a list of the most recently viewed Filings (up to 8). The list of Filings is organized with the most recently viewed Filing at the top and the least recently viewed one at the bottom. If you wanted to open “Last Week’s Filing”, simply click on it and the Filing Details screen appears. Note that after viewing “Last Week’s Filing”, it now appears at the top of the list of Recent Filings. We hope this feature saves you time working on your tariffs and filings so that you can better enjoy your morning coffee.